BNWT ZARA SNAKESKIN PRINT LONG SHIRT DRESS SIZE S New season. Completely sold out! Bloggers favourite! From clean pet, smoke free home. 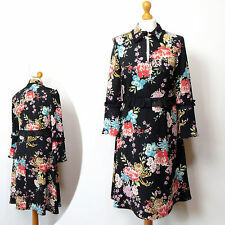 George Asda Oriental Floral Multicolour Bold Black Midi Shirt Dress Size 10 . Condition is New with tags. Dispatched with Royal Mail 2nd Class. Beautiful floral dress. Rrp £20. Sold out. Not lined. Non stretch. 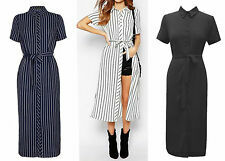 Revamp your wardrobe with one of our favourite trends the shirt dress. floral stripe print. model is 5ft 7" & wears UK size 8/EU size 38/US size 4/AUS size 8. A must have item. Ladies stretch cotton mini pique polo dress in black. Classic polo shirt dress from Lacoste which I am having to admit doesn’t fit me! Size 36 which will fit size 6-8 but please check the measurements which are as follows: Shoulder to shoulder: 14” Pit to pit: 17” Waist: 30” Length: 34” Thanks for looking and please check out my other items. Any questions please do ask. I’m happy to combine postage. Midi length. Fitted shape and a straight skirt shape with side splits. Substantial silky feel fabric. Black with a subtle broken stripe and floral print in pinks and greens. 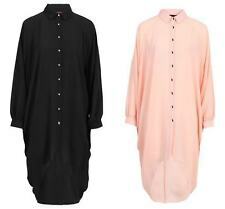 A gorgeous shirt dress by M&S. Dispatched with Royal Mail 2nd Class Signed For Please check the measurements before bidding to avoid disappointment Length 48" Short sleeves . With elastane for stretch. Never worn. Only ever tried on. Woman Within Buttoned Front Crinkle Shirtdress - Rose Bouquet. 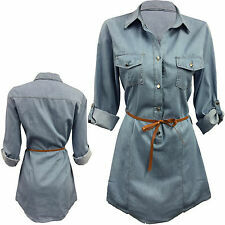 This crinkled shirtdress is so comfy and so relaxed. Micro-pleating creates a beautiful sweep that moves while you walk, and casual three-quarter sleeves can be rolled and secured with a button tab. LAZY OAF Women's White & Pink Contrast Tunic Shirt Dress. Size Small.